NEW YORK, NY, JANUARY 23, 2014 – For the first time ever, fans will have the power to unlock exclusive content and rewards from authors by using image recognition technology to turn regular book covers into interactive media experiences. 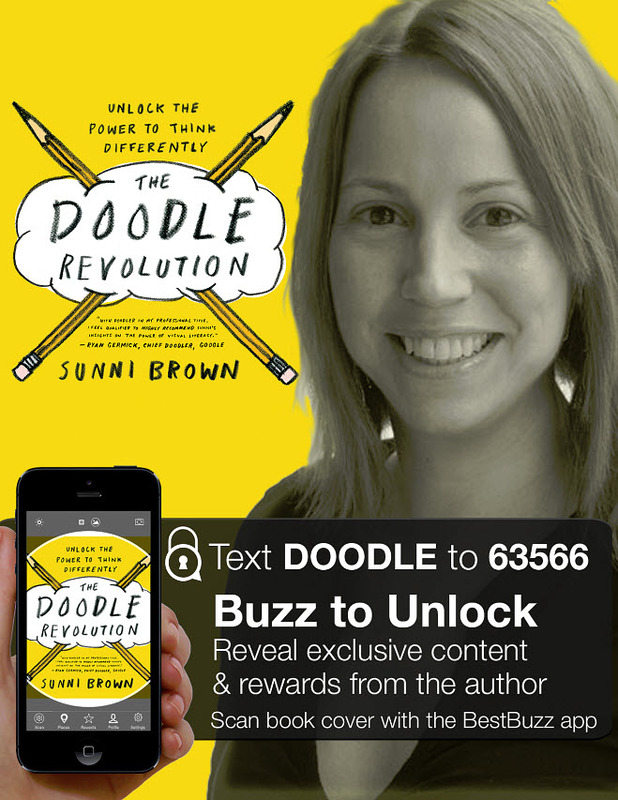 Author and TED speaker Sunni Brown has partnered with mobile tech company, BestBuzz, to leverage their proprietary technology and mobile app for her latest book release, The Doodle Revolution: Unlock the Power to Think Differently , published January 9 by Portfolio, an imprint of Penguin Random House. Brown is ranked one of the 100 Most Creative People in Business and one of the 10 Most Creative People on Twitter by Fast Company, and her TED Talk on doodling has drawn more than a million views. Her book was recently named an Amazon Best Business Book of the Month and CBS Sunday Morning aired her story. To trigger the image recognition experience, smartphone users can download the free BestBuzz mobile app or text the word DOODLE to the number 63566. 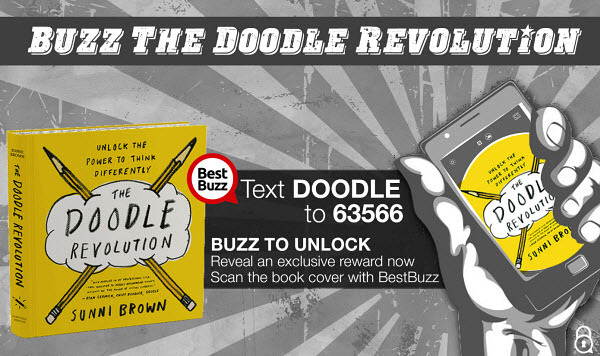 Upon opening the BestBuzz app, users align the target shown on their screen with the book cover of The Doodle Revolution, which will buzz when the experience is triggered. Doodle fans will unlock exclusive content and advocates are prompted to support the author by sharing with friends on social media to help spark the Doodle Revolution movement. What did Einstein, JFK, Edison, Marie Curie, and Henry Ford have in common? They were all inveterate doodlers. These powerhouse minds knew instinctively that doodling is deep thinking in disguise–a simple, accessible, and dynamite tool for innovating and solving even the stickiest problems. Sunni Brown’s mission is to bring the power of the Doodle to the rest of us. She leads the Revolution defying all those parents, teachers, and bosses who say “Stop doodling! Get serious! Grow up! “She overturns misinformation about doodling, demystifies visual thinking, and shows us the power of applying our innate visual literacy. The Doodle Revolution was named an Amazon Best Business Book for January, 2014, and was recently featured in a CBS Sunday Morning story on Sunday, January 19. 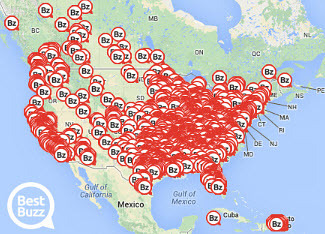 Ranked as one of the Top 10 Hottest Startup companies by Startup America and Tech Cocktail, BestBuzz is a social amplification platform that helps businesses create, manage and deliver real-time content to fans that scans mobile activation codes from product packaging, in-store displays and print media. Users can download the free BestBuzz mobile app to discover and unlock rewards from their favorite local businesses, brands, media publications, and consumer products. Start scanning QR codes, UPC barcodes, images and logos marked with the BestBuzz icon to instantly earn points and unlock exclusive offers from partners. To learn more visit: http://sunnibrown.com/ and http://bestbuzz.bz/or follow @sunnibrown and @best_buzz. A new study from the Association of National Advertisers and MediaVest, a leading media specialist agency, shows that the majority of the marketing industry is beginning to focus more heavily on the mobile space. Mobile marketing is becoming a very important aspect of advertising, due to the large number of mobile consumers there are in any given market. The study draws upon information gathered from 68 client-side marketers, many of whom are members of the Association of National Advertisers, during the fourth quarter of 2012. According to the study, 85% of advertising firms plan to significantly increase their mobile budgets in the very near future. These firms are expected to focus more intently on engaging consumers through various mobile marketing initiatives. Many of the brands that these firm represent have expressed interest in such mobile marketing initiatives, leading advertisers to develop strategies that will take advantage of the growing number of mobile consumers. Location-based marketing, or geomarketing, is expected to be one of the major priorities that advertisers have in the future. Location-based marketing is becoming increasingly important for local brands that do not have access to the same resources that large companies do. Advertisers using location-based services, especially those associated with social media networks, can develop hyper-localized marketing campaigns that have, in the past, proven very successful among their targeted demographic. 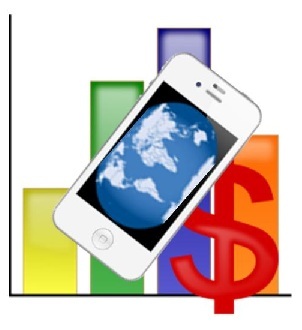 The study shows that 42% of advertisers are have concerns regarding mobile metrics and tracking system. Without adequate metrics in place, being able to fashion a comprehensive marketing campaign is a significantly more difficult task. These marketers have also cited their inability to prove any feasible return on investment as a major roadblock toward their adoption of mobile marketing. Nonetheless, the vast majority of advertisers are convinced over the potential prospects of mobile marketing and what gains they may see through its use.